Comprehensive blog about all kinds of fashion beads for jewelry, fashion accessories and fashion jewelry trend. 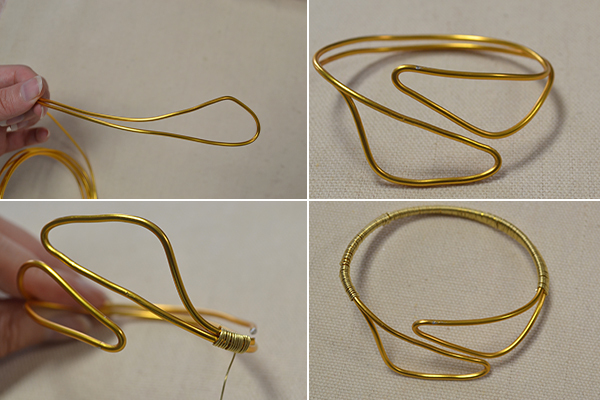 Secondly, cut off a part of golden copper wire and wrap the middle part of the aluminum wire bracelet with it. 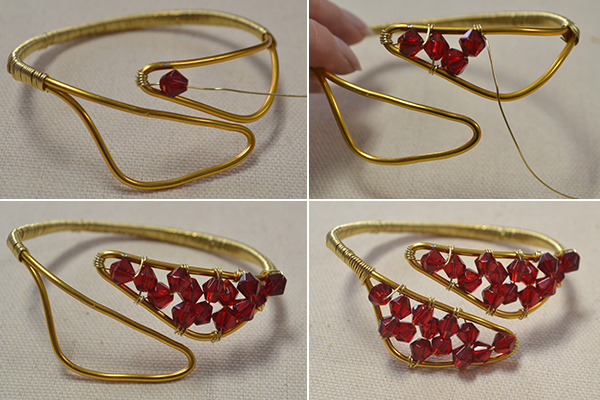 Secondly, refer to the above step to add red glass beads to the other triangle pattern. Tada, the wire wrapped and red glass beads bracelet is finished. Now, I wear it around my wrist. 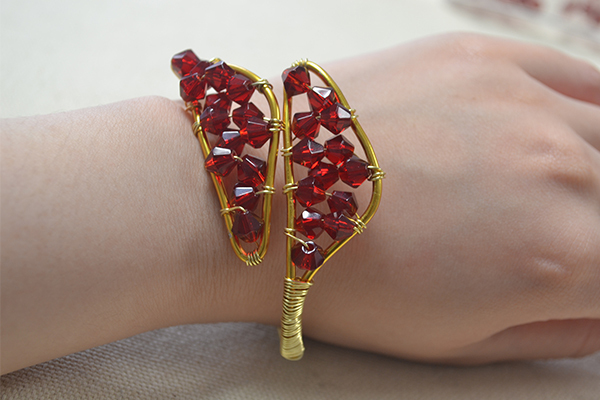 This wire wrapped and red glass beads bracelet is quite easy to make. If you have any questions during the making of the bracelet, just feel free to leave a comment below. Give it a try with some wires and glass beads! 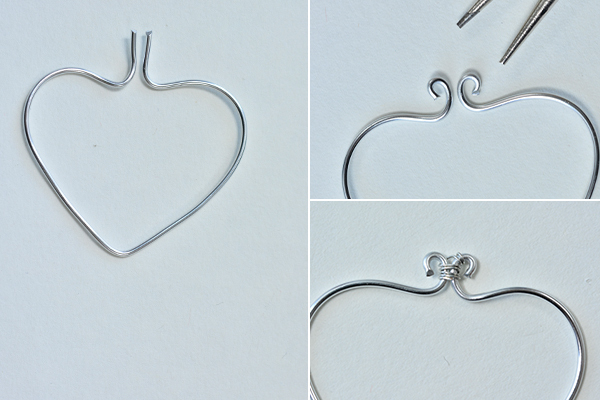 Step 1: cut off a piece of aluminum wire, twist the wire into a heart shape, make two loops, combine the ends with copper wire. 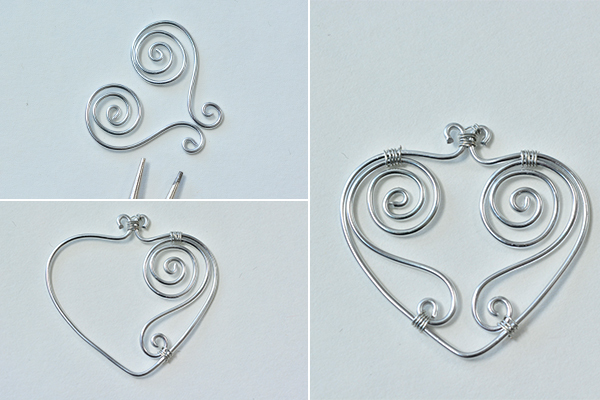 Step 2: make two loop aluminum wire patterns, then add then to the inner side of the large heart aluminum wire. 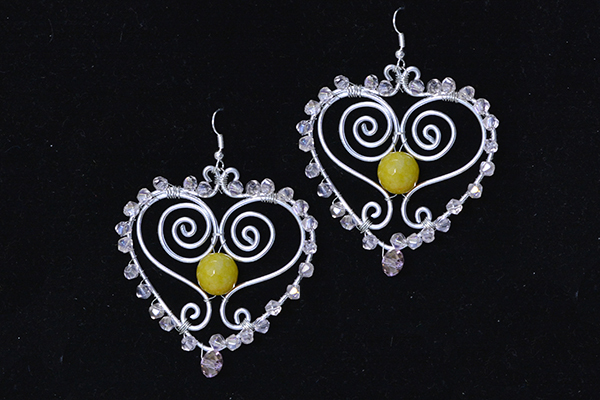 Step 3: Add the pink glass beads around the heart, add a yellow jade bead, then add an earring hook. 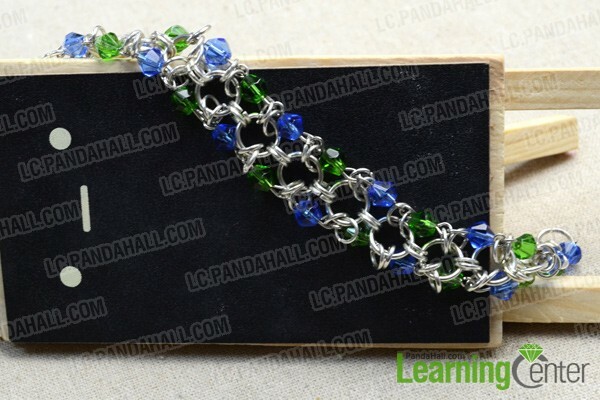 Fresh colors are always perfect for spring and summer days, so, to welcome the coming summer days, today I’d like to share you a tutorial on how to make a fresh colored glass bead chainmail bracelet, hope you like it. Step 1: Make the bead links. 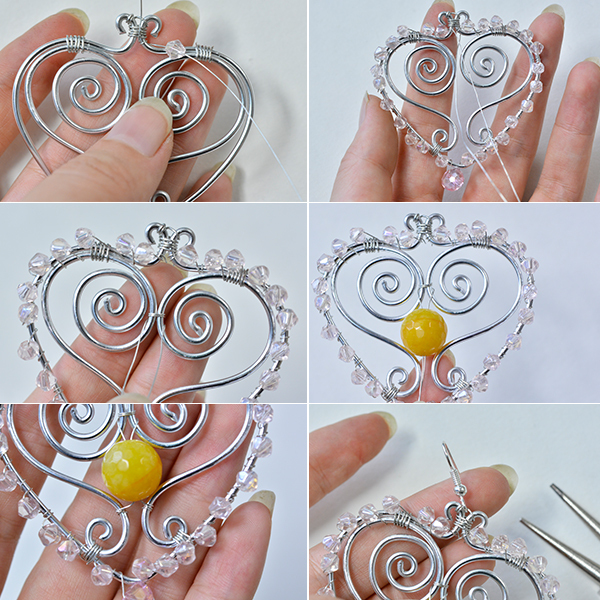 Slide a glass bead onto an eyepin, make a loop at the bead end and cut off extra wire. 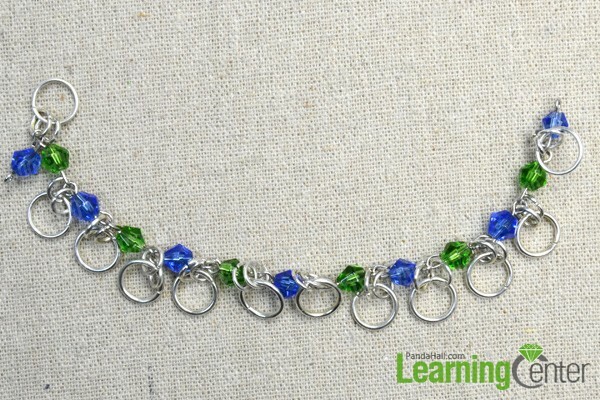 Repeat to make as many bead links as you need (it depends on the size of your wrist). Step 2: Connect the bead links to make the main part of the bracelet. 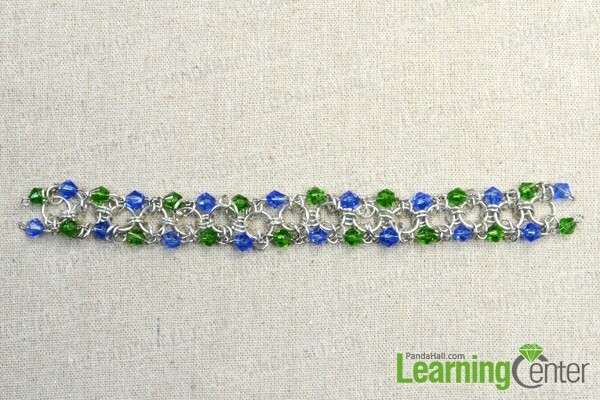 1st, alternatively connect the green glass bead link and blue glass bead link together. 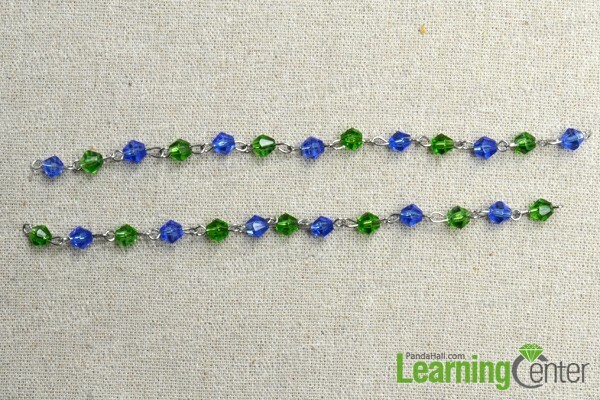 2nd, make two bead chains, mind the arrangement of different colored beads. 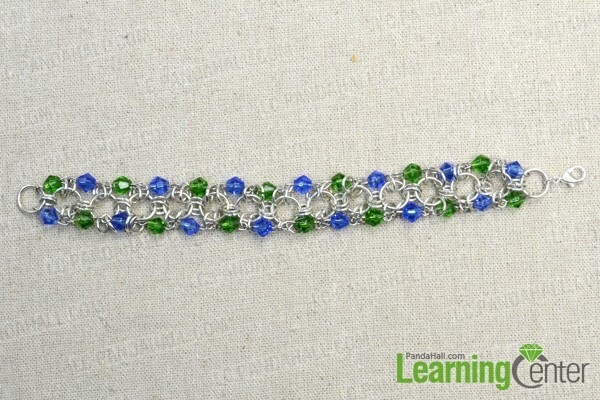 Step 3: Finish the beaded chainmail bracelet. 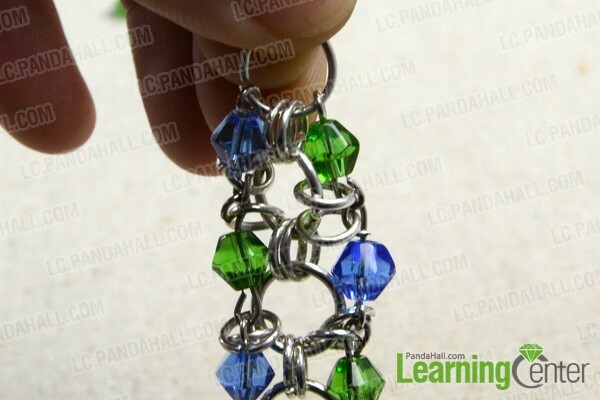 2nd, repeat the previous step to add small jumprings to another bead chian, and connect two bead chains together. 3rd, link each two neighboring big jumprings with two small jumprings. 5th, add a lobster clasp to finish the chainmail bracelet. So cool right! And it’s super cute for summer days. If you are going to make it, just take your time and mind the arrangement of beads and jumprings. Happy crafting! Glass beads are the well known beads widely used in making jewelries today. The glamour and glitter of these beads types make it look more beautiful that it adds glamour to the wearer. You can be assured of stealing a show in your dinner date or some social party by wearing jewelries in glass beads. These are cheap and the beauty cannot be matched with any other. In fact, it is difficult to differentiate the jewelry of precious metal from the glass beads jewelry types. Colors and shapes: The variety in glass beads is available and includes innumerable factors favoring this bead type. Even crystal beads looks good, but it has lesser color shades and shapes than the glass beads. The regular colors available are magenta, blue, aqua, green, yellow and red. These glass beads also come in multicolor and offer the advantage of being available in most stores to purchase. You can combine gemstones and glass beads while making jewelries. Apart from these two, you can include crystal beads as well and you will notice that these additions make the final product very stylish and offer an expensive look. Materials: Glass beads are made using different materials. The common material is the matte glass, diachronic glass and lamp work glass. The raw materials come in inexpensive prices and this is one of the best benefits that contribute to overall cheap purchases. Apart from these raw materials, the glass of old vintage can be used. Jewelry makers can also get beads with holes that can be easily threaded to makes fascinating glass jewelries. Glass beads always stay ahead in jewelry making and people prefer it for its price and beautiful looks. In fact, crystal beads also can be chosen instead of glass beads. These have a glass combined with lead and the quantity of the lead is hardly 1%. This simple addition of lead adds weight to crystal beads and it weighs more relatively than glass beads. However, glass beads have the same glitter and sparkle as crystal beads, making jewelry using the commonly available glass beads allows you to mix different colors. People having great ideas on color combination can make an amazing outcome of the jewelry design. You can decide even single color, but adding pendant of different colors helps in bringing the beauty to the fore in the final. Glass beads make fantastic jewelry. Using an assortment of glass beads in different shapes, tones and sizes, it can be used creatively in subtle to large bands, petite to striking charms. The beads in glass not only look beautiful as any other precious gem, but also appear luminous and dazzling, besides being cost effective. The variations are diverse with regard to its practical applications. However, the probabilities are unlimited. However, prior to generating ideas on jewelry variations, it is essential to possess a creative design idea. 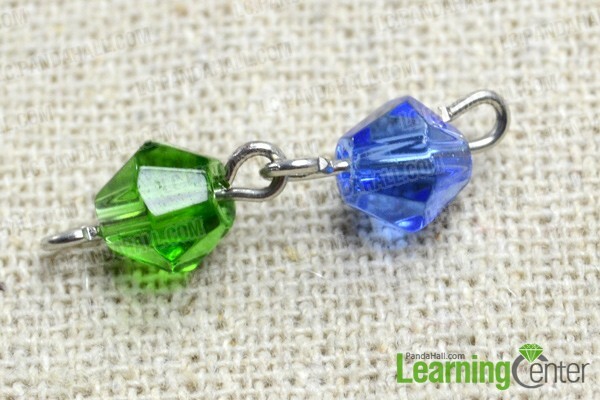 Show proficiency: Prior to deciding on jewelry item you must understand the glass beads types available. You will see there are different glass beads produced from recycled glass, blown glass, antique glass and Italian glass, besides many other types of glasses. The size may vary, some may create a distinct statement and the variations may be appealing. Producing a jewelry design, earrings or pendants, the colors may be dynamic or restful. However, paying attention to the colors reveals your proficiency in crafting new ideas. Alternative textures: Handmade jewelry pieces are exciting design ideas. 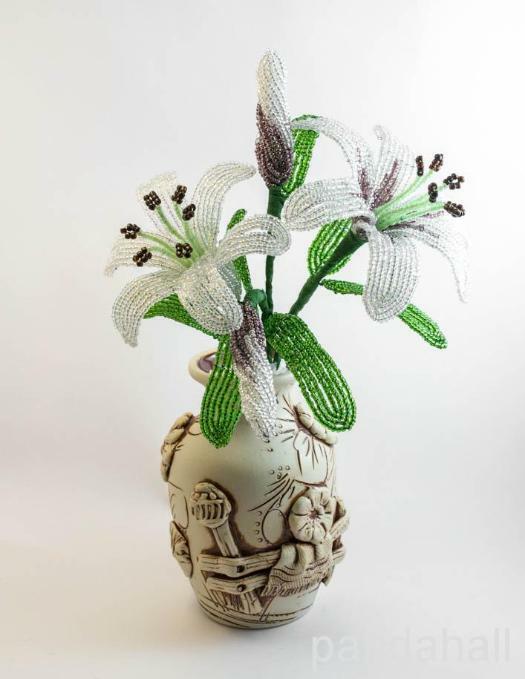 For instance, you can make small beads in one layer and place above the larger types or for an attractive effect blend objects such as wool and textile making use of the glass. Strength of creativity: Creative ideas help you in designing the jewelry pieces. You can examine the natural world and can use essential design ideas such as blossoms, flowers, animals and insects for jewelry pieces. The creativity strength of glass beads is that you can form any design and get your personal wardrobe. You can design a precious metal band or a new necklace from small glass beads and using the glass beads mix with other textile materials, make appropriate use of creativity. Noting down design ideas is a fantastic way of creating jewelry. You can sketch the document and design other ideas about design. Documenting your ideas will help in creating and it is also helpful in finding or recalling your idea when you wish to start the work of creating glass beads item in urgency. The need for pondering or thinking what was the creative idea and how to begin with it may not be required. The glass beads are useful in all the ways and so making a note of each design is useful as it can be alternatively used in textiles, bracelets, jewelry or any other piece. Glass beads are highly popular bead types in the jewelry making world today. The reason for this popularity is that they are simple to work using them and the catchiest fact is that they are inexpensive. Fortunately, nature has made these beads types to be highly affordable. They can be used to make pretty jewelries and are worth consideration. Pins: The glass beads may be used in the creations of pins. 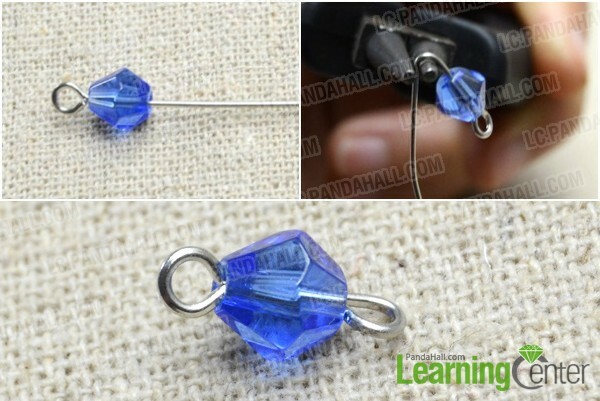 The safety pins are very useful and using glass beads in safety pins is thrilling. The best part is there are several options of glass beads available out there and thus will just cost few pennies. This gives you a chance to consider them in using in different ways that you can enjoy brilliant results. Array of Choices: You can make many different things in glass beads and this is based on your creativity. Jewelry makers will accept the fact that these beads are the best options for making necklaces. People fancy wearing necklaces, so when studded with glass beads, they are sure to create high demand commercially. Women prefer necklaces as they are incredibly pretty and are highly inexpensive when compared to other beads types and necklaces. Glass beads are of immense use in necklaces making is well known now, but the fact is that it is nowadays the trend to use it as a hair styling complementing the hair. These beads ensure unique hair style and they are the cheapest hair accessories types that can be purchased any time and also is a beautiful way or making a remarkable face lift. Bear in mind there are many ways to use glass beads and undoubtedly considering them in your accessories or jewelry is appropriate. There are abundant benefits on using such types of beads. The fact of these glass beads being inexpensive makes buying glass beads highly preferred choice. The cost of buying does not stress your wallet nor do you have to compromise on your other purchases. In this way you can use the best beads types available in the market. Glass beads have made a special place in the market and are one of the popular types. These are available online as well making it the most convenient way to get appropriate deals on each purchase. Buying glass beads implies there are two types namely, rounded smooth beads and faceted beads. The rounded smooth beads are shaped and polished carefully such that they have no sharp edges. On the contrary, the faceted beads are cut precisely such that their faces are flat. Using glass beads you can make something, but think carefully and choose the right glass beads, so that your expected jewelry has the desired attractive look. Rounded glass beads are made carefully using special manipulation techniques of glass. There are globules available made in machines and they are regular, but the handmade globules are less regular in shape. These rounded beads are made smooth by polishing such that there are no abrasive edges hurting the skin. Smoothing and polishing the beads surface helps in regulating the beads shine. These reflect the light back and hardly twinkle. The beads look dull in color, but are of great interest for the jewelry makers. These are great to be worn as a daily wear with your everyday outfit. Faceted glass beads reflect light in a unique pattern as they are cut in geometric shapes. The corners should be rounded carefully to avoid risk to the skin of the wearer. Reflection of light on the smooth surfaces is possible at different angles and this helps to give a sparkling appearance to the beautiful beads. These beads are suitable in projects that require shine or sparkle. Faceted beads make an amazing choice for bracelets or necklaces as they are designed for an evening out or even other special occasions to dazzle around. The added advantage is that the bead with more faces means the more it sparkles. 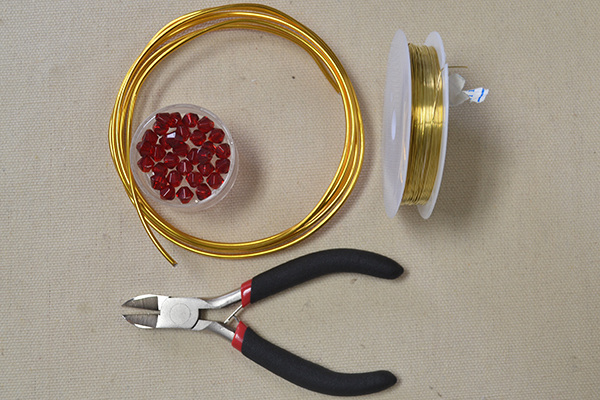 Generally, it is simple to make round small beads than making the facet small beads. The rounded globules are easily created, but the faceted glass beads are different and they crack easily when cut as they are small. Owing to this the faceted smaller glass beads are expensive than the rounded counterparts. In case, you are looking for small beads, consider the round ones than the square options. Buying small beads is best done by ensuring you do not leave tiny beads around, it may be harmful to children and animals, alike, if it is swallowed. So a meticulous search and buying is insisted in regards to glass beads. Glass beads are to make jewelry, but may be used to decorate purses, and several other items. It can be purchased from online or retail stores. Buying beads may appear to be a simple buy, yet you must know to buy them. It is best to buy them from wholesale suppliers in large quantities, so that it comes in cheap price. Even if you do not want a bulk purchase, a group can together buy at a time and save more money on larger quantities. At season ends, buy seasonal pieces, you are sure to get clearance stock and also save money. Bear in mind to consider the shipping charges. This is because you must not end by paying more online on shipping than the actual beads purchase. Glass beads must be kept in zipper snack bags, baby food jars, pencil pouches or in boxes that feature lots of compartments. This helps picking the type you want at the right time. 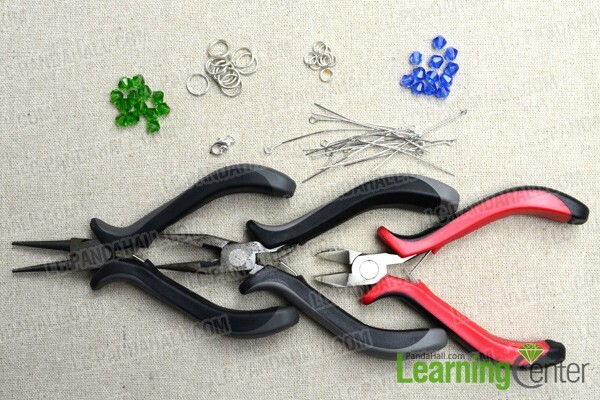 Prior to using keep handy a pair of wire cutters, ready to assemble jewelry beads, a long nosed pliers ready. Keep everything ready on a table. Ensure the light source is perfect. Move the pieces; separate the beads depending on their sizes, center holes and color. This will help in determining easily the piece you need amongst your supplies. Place the glass beads in a bowl, use an effective denture cleanser used to clean false teeth. This will keep the glass beads perfect. You may just drop in the bowl one denture cleansing tablet and pour hot water so that the cleanser works. Most denture cleansers work in less than five minutes, but the more time you leave the beads in the cleaner solution, it is sure to give a better shine. After 30 minutes of soaking maximum, you can use a spoon and pick it from the bowl and allow it to dry on a clean dry towel. Glass beads are equally used in jewelry crafts, and as decorations on accessories and clothing. You can buy them online, or even from some brick and mortar stores, but remember to check the quality for cracks or holes. Glass beads are available in such a huge variety that every jewelry maker likes to include them in their creations. Using multi colored glass beads you can give a piece a twist of sophistication. Although made of glass, these beads are a huge crowd puller because of their similarity to crystal. As crystal jewelry is expensive, many people prefer to go for glass beaded jewelry. Overall, by creating such jewelry pieces, you can not only add versatility to your collection but also attract more clients of all age groups. Jewelry made of glass beads has a classy look, which women and young girls love to adopt. These beads have varied textures; for example, frosted glass beads are not as shiny as normal glass beads. Moreover, the shape of the beads differs as well. There are round beads, which are amazingly smooth to the touch. Next are cone beads, which are shaped like cones. Bicone beads are interesting because they look as if two cones have been stuck together at the bases resulting in a cone at each end. Oval shaped beads shine immensely and can be used in combination with round beads. There are many other shapes and you can check the catalogue of a reputable online bead seller to see what other options are there. These beads are being used in jewelry for centuries. The lampwork beads were very popular in the 17th century Europe. Blowpipes and oil lamps were used to make them. Now, factories use glass torches for making perfect lampwork beads. Similarly, millefiori beads were made from glass rods. However, today, polymer clay is used, which has effectively reduced the manufacture duration allowing impressive mass production. Therefore, you need not worry about the supply of these beads, as with developed technology they are being produced in heavy quantities. 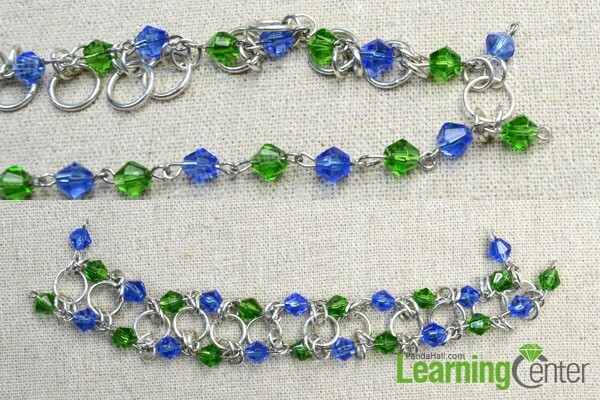 Can you experiment with glass beads? 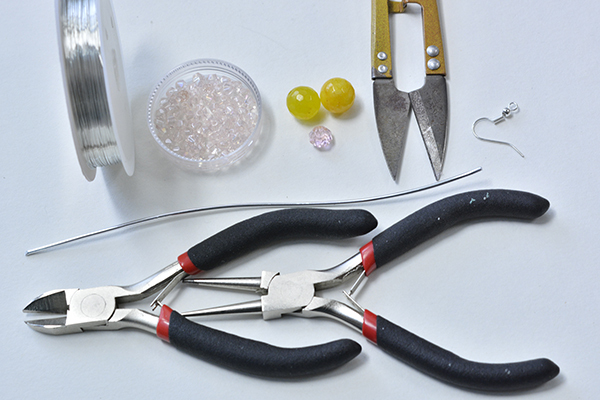 Yes, for a jeweler, it is important to keep experimenting because that is how you can create new jewelry pieces. These beads are available is so many colors, shapes and have such fascinating textures that you can conveniently experiment with them. Go for wholesale beads, as it will allow you to acquire a huge number of them at one go. It will also help you create numerous jewelry pieces and not feel restricted because of lack of beading supplies. 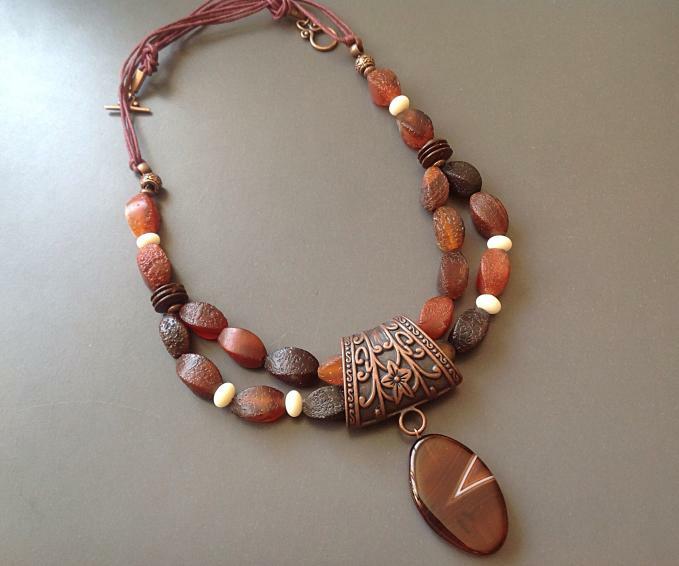 Today, I’m featuring some wonderful handmade jewelry projects by Florewela Cornelis. Her named these beauties as “My Secrete Corner”, sounds like she is quite obsessed with a hidden corner creating such pretty stunning accessories, alone but happy! You may find all of above design used with bright colored transparent glass beads, which are one of my favorite beads among all other jewelry beads, and this is also why I choose to feature her work. Glass beads always give me a sense of purity, quietness and lots of elegance. Click to get bigger image and you will find these ideas are quite easy to follow, hope you’ll be inspired by them! Happy crafting!